Yes, you can serve this with other Indian dishes, and with roti or naan bread, but why shelve it till then? 1 Trim and slice eggplants. Mix together 2 teaspoons of the salt and the turmeric. Spread a little salt and turmeric mixture (wear disposable gloves to avoid yellow nails) over each slice of eggplant, putting eggplant slices in a colander as you coat them. Leave the colander in a sink to drain for 30 minutes (turmeric stains some surfaces, though not stainless steel). Pat eggplant dry with paper towels. 2 Heat 2 tablespoons of oil in a large frying pan (skillet) over a medium-high heat. When hot, drop in as many slices of eggplant as will fit and fry until deep golden on both sides. Transfer to a plate and continue frying the rest of the eggplant slices, adding more oil if required. 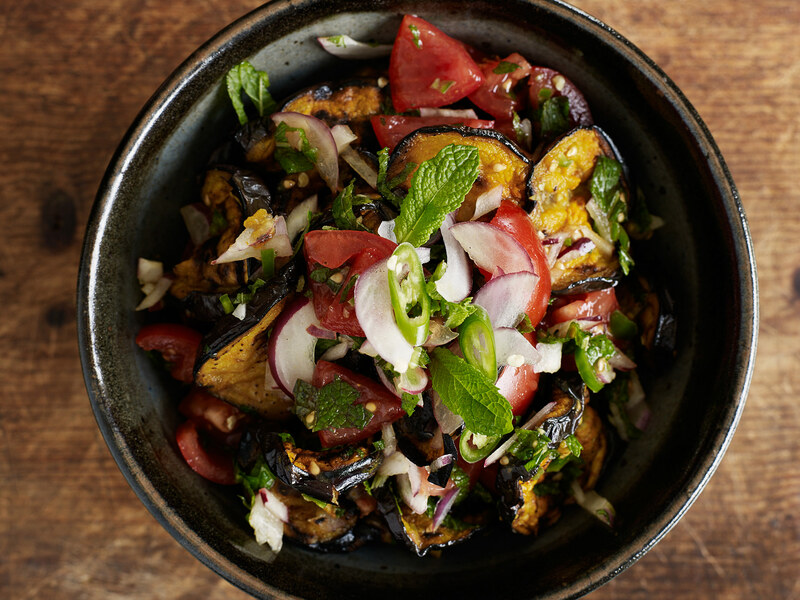 3 When all the eggplant slices are fried, put them in a bowl and add onion, chillies, lemon juice, tomatoes, mint and remaining ¼ teaspoon of salt. Stir gently, cover with food wrap and chill until required. Serve garnished with red onion and mint. Rev up your midweek meals with a spicy fish curry. Whoo-hoo. Yellow gold. An antiseptic, a gargle, a digestive aid, clears sinuses, too, and it's a much-loved preservative in pickles and chutneys. Add some to your vege shakes for a health kick. Almond Milk with Turmeric – What a tonic!